A 10 minute run-down for the attendees on day one! It is a long time since Read-out actually physically attended a user group meeting. I think it was the Pantek/Wonderware event (Wonderworld) held in Northampton in England in 2006. These events have caught on like wildfire in the last few years and Read-out has been an enthusiastic follower on the internet since and as the advancement of technology allowed. In fact in some ways I think that following these events from afar can be fairly exhausting as one tries to keep up with all the other things that fill a busy day. 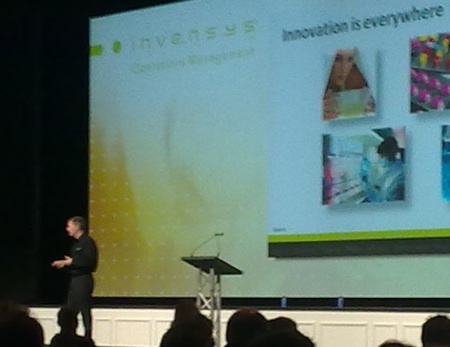 We were particularly delighted to receive an inviatation to the Invensys OpsManage EURA, not only because it was being held in Paris (F) but because we were anxious to see for ourselves the transformation in this company over the past few years and how it had made liars of the naysayers and purveyors of doom. Or had it? Way back in the sixties the king pin in process automation was Foxboro. It was regarded as the Rolls Royce of instrumentation. Then it sort of disappeared almost without trace replaced by some newbies and some others who were subsumed into vast conglomerates. Foxboro itself was bought out by Siebe a realatively unknown but adventurous British company which went on to buy Eurotherm and Wonderware. Overstreched financially they then merged with BTR and named the new company Invensys. The new company was a hodgepodge of companies which seemed not to interact with each other and this “biggest company you never heard of,” of the launching advertisements, started a spiral downwards starting the predictions of its eminent demise among the chattering classes. From this somewhat unpromising base durning the past five or six years the company has managed to reinstate itself in its rightful place among the top five automation companies in the world. It has not been an easy task and we hoped to be able to see what the ‘culture” of the company now was. There was remarkably little tweeting from this event as a whole which means that unless somebody was there one would not have much idea what was happening! We arrived late on the first morning, during a coffee break and in the sizeable lobby area we were first struck by the large crowd chatting excitedly about the first two keynotes, including words for the charismatic President and CEO, Sudipta Bhattacharya. This left at least one Invensys employee with whom we spoke, ready to burst out of the auditorium and conquer the world! I was sorry to have missed that. 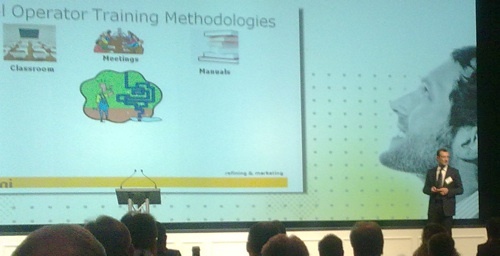 In fact the first keynote I attended was by Thierry Bonte, President Factory Systemes/Wonderware France. It was a talk on Strategic Innovation and its direction was refreshingly optimistic and open. Was this a clue as to how this company is progressing? Productivity innovation is needed now more than ever he declared. If we look around us innovation is everywhere. 90% of products in supermarkets were not there five years ago. (Another fact is that 90% of pharmaceutical products will come out of patent by 2013, which will have an impact on production too). Things are changing and will continue to change. For global companies the world is village and everything we do has an impact everywhere. We must respect the environment we find ourselves. After this talk we were entertained with a ten minute express-train type run-down of the format of the rest of the event(See picture at top-of-page). There were nearly nine hundred people attending this event and they then divided up into sessions over the two days. There were industry solutions sessions highlighting power, chemical, life sciences and oil/gas. The product sessions were designed for users and potential users who wanted to expand their product and technology strategy, direction and application knowledge – empowering users to deliver real-time results. There were also training sessions of various intensities, from half-day technical training workshops, ninety minute seminars or 45 minute hands-on experiences. A track called Enterprise Technology & Services concerned topics relevant to IT asset management, networking, cyber security, virtualization, consulting, delivery, support and learning services. Cyber security was a subject which attracted much interests considering the Stuxnet malware discovered earlier this year. Finally all through the event, the Collaboration EXPO was open for more casual involvement. This was an area with about 30 stands of companies both Invensys and ecosystem partner companies which offered further possibilities of plant improvement not only by use of Invensys products but also by using the additional expertese and specialist knowledge of many innovative and “niche” smaller companies. This EXPO area had four theater areas dedicated to Control Excellence, Asset Excellence, Productivity Excellence and Environment & Safety Excellence where listen and learn how to improve their performance in these areas. During each day a stream of announcements were made some of which were concerning the European Region, Russia and Africa, and others which had already featured in the larger OpsManage’10 North America held some weeks previously in the United States. We have listed these in a box on the right. We took particular interest in the announcement, Three added to partner ecosystem, of the endorsement of three new Europen companies into the unique partnership of Invensys System Integrators (SI) – what they call their ecosystem. These companies from France, Ireland and Norway. This is not an easily achieved qualification. All SIs must undergo a detailed business process assessment and have been certified for several years on their expertise in implementing Invensys technology at customer facilities. They have been identified as providing comprehensive software solutions with a track record of increasing customer efficiency, reducing costs and maximizing customer profits. And of course we were delighted for the Irish company, ONG Automation, which is the only company in either Ireland or Britain to achieve this status. During the second day Rashesh Mody, Invensys Senior VP, Portfolio and Strategy, gave two keynotes, one at the start of the day giving an illustration of the company’s shorterm roadmap, “Enabling the customers’ operational excellence journey!” These were through the excellences highlighted in the theaters at the Expo part of the event: – Control Excellence, Asset Excellence, Productivity Excellence and Environment & Safety Excellence. 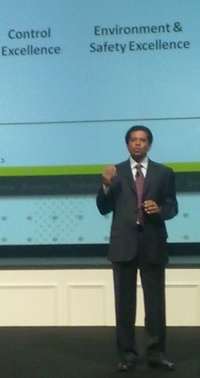 He also delivered the final keynote on the longterm roadmap of Invensys. They have a clear understanding of the way ahead, sometimes difficult, sometimes unexpected but we got the impression that here was a company, or rather a group of companies with a common goal and working together to achieve it. One of the most fascinating items was spoken about by Gaetano De Santis, of the Italian ENI company. It had the fascinating title Refinery Safety by Gaming. This was about using the technology used in computer games for training personnel in refinerys (and in other sensitive areas). This type of training is used in the training of pilots as well. There was also an opportunity to “play” with this equipment in the Expo area. An announcement on Virtual Reality Training, which is the co-operation between Invensys and ENI, was also made during the day. During the meeting, Invensys Operations Management signed a strategic alliance with Russia’s National Center for Development of Innovative Technologies (NC DIT) and TimeZYX Group ( an organisation within the NIC DIT). This partnership is to deliver reservoir and surface facilities simulation to the oil & gas industry. In one way all these user conferences cannot be said to be entirely objective. They are not meant to be are they? Here we heard of the advances being made by one company in Africa, Russia and other territories. But are these stories that much different from those among the others of the big five? The important thing in the new paradigm is that the old way of doing business is changed utterly and what I saw in Paris told me that Invensys realises this but the transformation that is happening is an on-going development. The message is permeating through the company itself but some, perhaps many, customers remain to be convinced. We said earlier that we had felt that Invensys Operation Management has advanced much in the last few years in the cooperation between its various component companies while maintaining their valuable identities: Avantis, Eurotherm, Foxboro, InFusion, IMServ, SimSci-Esscor, Skelta, Triconex and Wonderware are without doubt Invensys companies but they are also identifiable trade names and or technologies interacting and influencing each other. Their literature though obviously a corporate design also lists these product names so the identities and traditions of each component company is alluded to. This loose-tight relationship if it continues as it has in the past should enable “the customers’ operational excellence journey!” So long as they continue to realise that “Applying old remedies will not work!” and that they continue to “be aware and make decisions on it,” Invensys Operations Management will without doubt proudly continue to be in the top five automation companies. This entry was posted on Monday, November 22nd, 2010 at 9:59 am and is filed under Automation, Events, Process Automation, Training/Education. You can follow any responses to this entry through the RSS 2.0 feed. You can leave a response, or trackback from your own site.